On the Saturday following Thanksgiving, I was visiting Pima Air and Space Museum. We were in Hanger #4 to view the beautifully restored B-29, when I happened to take notice of a P-51 Mustang near the big bomber. It's name? "Bad Angel." 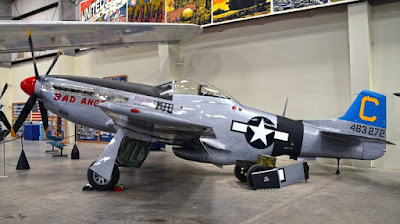 I was admiring its aerodynamic lines and recalled enough history to know that until the Mustangs came into service, the skies over the Pacific Ocean were dominated by Japanese Zeros. Then something very strange caught my eye. Proudly displayed on the fuselage of 'Bad Angel' were the markings of the pilot's kills: seven Nazis; one Italian; one Japanese AND ONE AMERICAN. Huh? "Bad Angel" shot down an American airplane? Kill marks on "Bad Angel"
Was it a terrible mistake? Couldn't be. If it had been an unfortunate misjudgment, certainly the pilot would not have displayed the American flag. I knew there had to be a good story here. Fortunately for us, one of the Museum's many fine docents was on hand to tell it. ******************** And so the story goes:........ In 1942, the United States needed pilots for its war planes, lots of war planes, lots of pilots. Lt. Louis Curdes was one. When he was 22 years old, he graduated flight training school and was shipped off to the Mediterranean to fight Nazis in the air over Southern Europe. He arrived at his 82nd Fighter Group, 95th Fighter Squadron in April, 1943, and was assigned a P-38 Lightning. Ten days later he shot down three German Messerschmitt Bf-109 fighters. A few weeks later, he downed two more German Bf-109's. In less than a month of combat, Louis was an Ace. During the next three months, Louis shot down an Italian Mc.202 fighter and two more Messerschmitt Bf-109's before his luck ran out. A German fighter shot down his plane on August 27, 1943, over Salerno, Italy. Captured by the Italians, he was sent to a POW camp near Rome. No doubt this is where he thought he would spend the remaining years of the war. It wasn't to be. A few days later, the Italians surrendered. Louis and a few other pilots escaped before the Nazis could take control of the camp. One might think that such harrowing experiences would have taken the fight out of Louis, yet he volunteered for another combat tour. This time, Uncle Sam sent him to the Philippines where he flew P-51 Mustangs. Soon after arriving in the Pacific Theater, Louis downed a Mitsubishi reconnaissance plane near Formosa. Now he was one of only three Americans to have kills against all three Axis Powers: Germany, Italy, and Japan. Up until this point, young Lt. Curdes' combat career had been stellar. His story was about to take a twist so bizarre that it seems like the fictional creation of a Hollywood screenwriter. While attacking the Japanese-held island of Bataan, one of Louis’ wingmen was shot down. The pilot ditched in the ocean. Circling overhead, Louis could see that his wingman had survived, so he stayed in the area to guide a rescue plane and protect the downed pilot. It wasn't long before he noticed another, larger airplane, wheels down, preparing to land at the Japanese-held airfield on Bataan. He moved in to investigate. Much to his surprise the approaching plane was a Douglas C-47 transport with American markings. He tried to make radio contact, but without success. He maneuvered his Mustang in front of the big transport several times trying to wave it off. The C-47 kept heading to its landing target. Apparently the C-47 crew didn't realize they were about to land on a Japanese held island, and soon would be captives. Lt. Curdes read the daily newspaper accounts of the war, including the viciousness of the Japanese soldiers toward their captives. He knew that whoever was in that American C-47 would be, upon landing, either dead or wish they were. But what could he do? Audaciously, he lined up his P-51 directly behind the transport, carefully sighted one of his .50 caliber machine guns and knocked out one of its two engines. Still the C-47 continued on toward the Bataan airfield. Curdes shifted his aim slightly and knocked out the remaining engine, leaving the baffled pilot no choice but to ditch in the ocean. The big plane came down in one piece about 50 yards from his bobbing wingman. At this point, nightfall and low fuel forced Louis to return to base. The next morning, Louis flew cover for a rescuing PBY that picked up the downed Mustang pilot and 12 passengers and crew, including two female nurses, from the C-47. All survived, and later, Lt. Curdes would end up marrying one of these nurses. 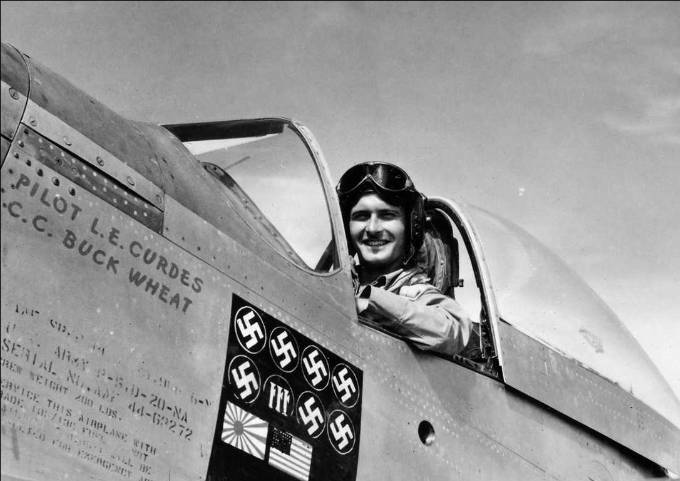 For shooting down an unarmed American transport plane, Lt. Louis Curdes was awarded the Distinguished Flying Cross. Thereafter, on the fuselage of his P-51 "Bad Angel", he proudly displayed the symbols of his kills: seven German, one Italian, one Japanese and one American flag. As Paul Harvey used to say “And now you know the rest of the story “ !! !